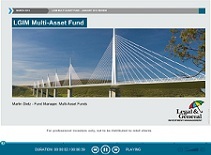 Following the yearly review of the Multi-Asset Fund, Legal & General Investment Management (LGIM) has produced a webinar covering the Fund's latest asset allocation and the rationale behind the changes. The LGIM Multi-Asset fund is a globally diversified fund that provides exposure to a wide range of asset classes in a cost-efficient manner. The Fund is designed to help pension scheme investors looking for long-term growth in a fund that's designed to deliver less volatility than a pure equity fund. The Fund is reviewed on an annual basis and this latest webinar covers the changes made to the Fund following the January 2015 strategic review.